Amazon, UPS and FedEx: How Does the Story End? In this final episode from our beach mastermind group. Andrew moderates a discussion between Bill D’Alessandro of Elements Brands and Zack Kanter of Proforged about how Amazon will change in the coming years. Bill and Zack spar over whether Amazon will consider buying out either UPS or FedEx. We also discuss whether Amazon’s aggressive moves will simply drive their competitors out of business. We attempt to answer these questions, but we also talk drone-delivery and discuss the future of eCommerce as a whole. Andrew: A quick note before we get started. This episode is one in a series that I recorded live, and unfortunately, I had a few settings wrong and the audio is not perfect. I still wanted to share it with you. However, I want to apologize for the audio quality and we’ll do our best to make sure it doesn’t happen again. All right, on with the show. 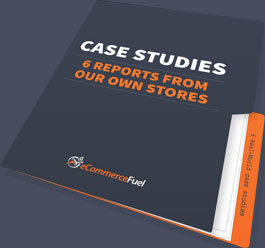 Hello, welcome to The eCommerceFuel Podcast. I’m Andrew Youderian and here with our third and final installment from Fripp Island where we’re doing a beach mastermind/eCommerce work-time/fun guys hanging out on the beach. Bill: The “workcation” if you will. Zack: Yes, Bloomberg News maybe a week or two weeks ago, published an article asking, “Will Amazon kill FedEx?” It’s an interesting question, because anyone who follows Amazon…you know, I like to say that the only way you get to see how scary Amazon is, is if you’re both a subscriber to Amazon Seller Central, Vendor Central, and AWS, Amazon Web Services. And you see the pace of what they’re doing is just unbelievable, the pace of change. So, you know, I think what the Bloomberg article touched on was Amazon has made a number of moves into shipping, and obviously the one that people are most familiar about is that Prime Air, Air Fleet that they’ve come out with so that they leased 40, I think, 20 or 40s large cargo planes. And they’ve begun flying some west to east, east to west routes. And we’re not exactly sure what they’re doing with those, but they’re using it to build out some capacity that FedEx and UPS don’t have. On top of that, they build a bunch of sorting centers to sort of speed up their USPS delivery and cut out some of the nightmare that is the Post Office between their far away distribution centers and the closer ones to the customer for last mile delivery. So, the question is, where are they moving? Is this capacity that they’re building out in addition to UPS, FedEx, and Postal Service? Or are they doing this with the eye on replacing things? And I think Bill and I, and probably Andrew, agree on a lot of things that are going on, but there are also a number of things that we don’t agree on. Andrew: Yeah. So, I’m gonna probably largely moderate this by chiming in a little bit. But I think you guys…it’s interesting. When the article came out on Twitter, you guys went back and forth with some slightly different opinions. Bill: Well, Zack shared it on Twitter, and I immediately replied. And he replied, and we started to get into it. And we said, “Why don’t we save this for next week at the beach?” And that’s why here we are on the podcast talking about it. Zack: We need parental supervision, I think, from time to time to keep things from getting out of hand. Bill: Keep things civil, yes. And Twitter is not civil. Andrew: So the way…plus you don’t have the checkmark. Zack has the checkmark. So everything that Zack says just seems much more credible. Bill: Right, but now I’ve got him in my arena on the podcast where I’m credible. Andrew: So I see there’s kind of four options going forward with ways that Amazon could implement this. You know, you could…Amazon could build out from scratch their own delivery network from the warehouse last mile all the way to the customer. Amazon could build out the most specific, or the most profitable sections of that, and maybe they just cherry pick where they wanna deliver. And then, perhaps say for places like some international stuff, or Alaska that subsidize, they piggyback off USPS, so they can do a partial integration. They could stop where they are and just use the threat of building this as a way to keep FedEx and UPS competitive. Or they could buy one of these carriers, UPS or FedEx, and just completely kind of annex them into their ecosystem. So, what do you guys think is most likely to happen? Zack, why don’t we start with you? Zack: Yeah, I think the least likely to happen is Amazon buying UPS or FedEx. The thing is, you know, Amazon has made a number of acquisitions, but they’ve got a very specific culture, and they have a way they like building things. And I think that that’s pretty tough to buy someone like UPS or FedEx, certainly not the Post Office although that would be a dream come true, for them to put them onto Amazon’s platform, which, you know, follows a very specific mantra, and a very hard work ethic, and is built without a lot of, you know, skeletons in the closet and dirty laundry that they have to rebuild. Bill: Also, I saw an article recently that Amazon is about 5% of UPS’s revenue, which I was shocked that it was that low. So that’s 95% of UPS’s volume that is non-Amazon, and I don’t think they would want to serve that. And I don’t think that they would shut it down either. Zack: Yeah, interesting. I mean, you know, when it comes to Amazon, I think UPS and FedEx are doing a pretty decent job. But you’ve got an eleven and a half billion dollar line item on their income statement for shipping expense. And it’s huge. It has to be one of their biggest single line items in terms of expense. I think the motivation is certainly there, and if you look at what Amazon’s saying publicly, Amazon’s saying, “Look, we don’t wanna compete with the Post Office and FedEx and UPS, we want to supplement for peak demand, you know, Prime Day and Black Friday, Cyber Monday.” But the thing is, you know, that’s a nice story that you say publicly, but come on. I mean, what Amazon has done is, you know, is pretty aggressive moves in terms of…we talked about those 11, or 15, I forget how many, is sorting centers that they’ve built. And what they did with that is they figured the Post Office is not very good at coordinating the first 80% of a journey, or maybe it’s very expensive. And so Amazon said, “We’ll build these sorting centers that aggregate shipments and then they send them to a local…they truck them to a local post office for final delivery. And Amazon now has 4,000 trailers that they’re using to do those sort of operations. Bill: And FedEx and UPS figured that out too, and that’s why you have services like SmartPost and SurePost, where they take trailers and pallets of packages to the local post office, and then the Postmen, who’s legally required to go to every address every day, delivers that last mile to the door. And so Amazon is doing something similar, but a private version of SmartPost/SurePost. Zack: Sure. And what I have a hard time seeing is Jeff Bezos saying, “Okay. Like we’ve built out some additional capacity, and, you know, we’re paying eleven and a half billion dollars a year to UPS, Post Office, and FedEx. Like let’s just call it a day. You know, let’s just keep paying them money.” Amazon’s hungry. I think they could do a better job of it, and my view is that they’re going to build out their own end-to-end carrier to replace UPS, FedEx, and Post Office. And I think they’re going to open up, like AWS, Amazon Web Services, to outside people, and they’re gonna provide shipping to everybody. Andrew: So, let me play Devil’s Advocate, ask a question here. And Bill, so before I do, would you say it’s…you think it’s unlikely they’re gonna buy one of these “big guys”, UPS or…. Bill: I think Zack and I agree that it’s very unlikely that they’re gonna purchase one of the “big guys” for a number of reasons. I think Zack and I also agree that they’re probably going to build out some very extensive end-to-end infrastructure. I mean, I got a package from Amazon the other day, and I looked out the window, and the guy that dropped it off had a sticker on the side of his car that said Amazon. They have the Amazon Flex Program, which is basically like Uber where in major metropolitan markets, you can sign up. And instead of driving people around, you drive packages around. And you earn money, you know, in your private car basically as a carrier. So, they definitely haven’t stopped at not building the last mile. I think they’ve built the first 80% as they are with Amazon Air. And then they’re also building this last mile with things like Amazon Flex and private Amazon carriers. And I think part of the reason they’re doing that is to supplement what the big carriers do, because UPS is probably not gonna be able to run a dedicated courier from a warehouse to your house to support something like same day delivery. I think Amazon needs a more flexible type of end-to-end logistics that the major carriers aren’t built for right now and don’t wanna be built for. So, I do think they’re gonna build out their own infrastructure end-to-end gradually, you know, and maybe a road on it from both ends. They’ve got Amazon Flex that’s doing the last mile, and they’ve got the carriers that are doing or they’ve got their airplanes that are doing cross country, and then maybe they’re using UPS and FedEx freight hub-to-hub. So, I think they’re gonna optimistically or opportunistically hop on, “Where can we use a carrier? Where is UPS better at this leg or where could we be better at this leg?” Because it doesn’t have to be all or nothing. I think gradually, they’ll phase out…they’ll figure out which routes they’re spending the most money on UPS, or most routes is costing the most money with FedEx. And they’ll opportunistically replace those with Amazon branded transport. And, as it grows, it will make more and more and more sense. Like they started with only a couple fulfillment centers. And now they have…how many do they have now? Fulfillment center. Bill: Over a hundred, 110, maybe? Zack: Yeah, a hundred plus. And it makes…you know, they started with the slam dunk, home runs, in certain areas, and now more and more and more areas make sense on the margin as they get bigger. Andrew: So, here’s a question. So looking at it from the buying perspective. So, they have…Amazon has a history of building out the infrastructure that they need, whether it’s AWS, they started using it, they built it up, and they still use it, but now they, you know, sell a lot of the extra capacity. Their fulfillment network, in terms of their warehouses, FBA, they built that. That didn’t exist. If you look at UPS and FedEx, of all the things they’ve built, I would say you could make a pretty good argument that the delivery distribution is probably gonna be the most audacious of all of those, it would be the hardest to build that and replicate. And you have something that, you’re right, they’re not gonna use it exactly the same way, but a lot of the infrastructure is already there. So that’s one thing. Bill: It seems like it might be. Andrew: Because from their perspective of their…their stock is valued so richly. Zack: Yeah. But, UPS is gonna…would drag down Amazon’s valuation, because it’s built on garbage. Bill: I mean, by revenue, I’d be willing to bet UPS is about the same size. By market cap, Amazon is a lot larger, because they’re commanding a higher multiple. So, it might be the type of thing where UPS would almost eat the company culture or the value of Amazon. If suddenly you bought this giant, old school carrier onto Amazon, which is why I think they won’t buy them. Because, all of a sudden, then Amazon would become one of the largest carriers in the world, and 95% of their UPS units revenue would be serving other people besides Amazon. Andrew: But what percentage of AWS do you think is serving other people versus Amazon? Bill: All of it. And so this, I think, is where we get to where Zack and I diverge, and what prompted this conversation. Because as Zack alluded to earlier, Zack said, “Yes, you know, I think they’re gonna build this.” To which I agree. And Zack says, you know, looking at Amazon’s history, I think they’re going to build the AWS of shipping whereby anybody can become a customer of this new Amazon carrier network and get their parcels from A to B, you know, with a basic API call for a lot cheaper, and that they’re gonna destroy…they’re just gonna cannibalize the existing carriers rather than buy them in the same way that they turned the hosting industry upside down with AWS. Is that an accurate characterization of your position? Bill: And my suggestion was like, “Yes, I agree with you that they’re going to build this. But I think they not only would be crazy, but I think Jeff Bezos would never outsource this to anybody else, because I think Amazon views the Prime program and their expertise in logistics as one of their primary secret sauces. And so I think they would be giving away the firm. I think they would view it as giving away the crown jewels. And I think it’s different than AWS for a number of reasons. The reason they think they wanted their website to be faster and better to host, and that’s why they built AWS. And the reason that they were able to chop up AWS and outsource it is because it doesn’t cost Amazon anything if your startup’s website is faster. Or it doesn’t cost Amazon anything if Netflix’s website is faster. But the ability to deliver something in one day, or six hours on a private network is the reason you buy stuff from Amazon and not from Walmart.com. Zack: Right. So here’s where I think you’re going wrong. Just because Amazon… So, let’s say Amazon builds out this beautiful carrier network, and now they’re faced with the decision of, do we open this up to outside folks or not? Do we let, you know, in your case, elements, brands, do we let you guys use Amazon shipping network to ship, you know, from point A to point B? What you’re assuming is that they would have to give everybody access to all the service levels. What Amazon could do, this Amazon freight company, is only let you ship, you know, second-day air, or five-day delivery, or four-day delivery. The same options as you have with UPS now. They’re not gonna give you access to Prime now and everything if you’re not selling on the Amazon platform. So, Amazon can offset a lot of their fixed cost, and they can get a lot of revenue from you by offering comparable levels to UPS and FedEx at, let’s say, you know, 10% or 25% more aggressive rates, and not give away the secret sauce. Zack: The railroads, let’s own everything, is because when you have a captive, internal customer, your service levels go down. You just can’t, without the competition of having to do a great job for customers, your performance goes down, and that’s part of the reason. It’s not just that Amazon wants to offload some of their infrastructure and get some more revenue to cover their costs on AWS. It’s that by opening up AWS to outside developers, they push their own standards higher, because they no longer are just working with the captive customer. So, that’s why I believe that with a shipping company, Amazon almost has to open it up to outside people. Otherwise, they’re gonna have the equivalent of the Post Office, which is this huge monopoly with Amazon as a customer, who is gonna be doing a huge percentage of the shipping every year and their service levels are gonna be terrible. Bill: So, I get that. I understand that you’re saying that you think the part…they may reserve Prime Now or Prime Drone Delivery for just Amazon packages that you sold on the Amazon platform, and then they might outsource second day, or ground, or whatever. But I think the second day or the ground is the service set that they’re least likely to build, because UPS and FedEx are already pretty good at that. What UPS and FedEx are not pretty good at are delivering packages by drone. You know, the stuff that’s gonna make Amazon unique. So, yes, they may…I think second day or ground would be the last thing they would build. And if they decided to build that, I could see them offering those services to compete with UPS and FedEx to get volume onto their network and have it start to make sense. But I think that…the first thing they would do is build a drone delivery platform and make it exclusive to the Amazon.com platforms. So if you wanted to be able to deliver your goods in three hours by drone, you had to sell them on Amazon.com. And if you, as a consumer, wanted your package delivered in three hours by drone, you had to buy it on Amazon.com. And I think that’s a closed ecosystem, it’s the Holy Grail. It’s essentially a monopoly, right? Zack: Yeah. And I agree that a lot of the…you know, obviously what they did with AWS was they built things that did not exist today, you know, at the time that they built them. So, they weren’t like, “Hey, let’s replace, you know, easy to spin up databases and servers.” They said, “This doesn’t exist, we have to build this.” So, I agree. They’re gonna build the stuff like Prime Now, Prime Drone Delivery, and, you know, self-driving car delivery, and everything before they go on and replace UPS and FedEx. But as Amazon takes up, you look at what percentage of e-commerce growth in the US is proportional to Amazon. You know, Amazon is responsible for a large percentage of the growing eCommerce growth every year. Bill: Overall. They’re eating the whole eCommerce market. Zack: Right. So, UPS and FedEx at some point are gonna peak, because Amazon is going to be fulfilling their own shipping demand out of their own services. And at some point, UPS and FedEx start hurting, they start raising prices, and now Amazon is forced to do the ground deliveries, the four day deliveries, the two day deliveries in order to make up for the declining service levels and the rising costs of UPS and FedEx. Andrew: What about a hybrid? I mean, if you look at Amazon, they have a history. Like you think about Zappos. They wanted to buy Zappos and before they did that, they pretty much competed with them head-to-head on price and sold at a loss with a lot of their shoe categories to pretty much send the message, “Hey, you can either sell to us or we’ll run you out of business.” So, Bill, you just mentioned that Amazon, their big value add isn’t ground, it’s because the legacy carriers do that really well. So, why not…could you make the case that with what they’re doing with Prime Air right now is to go in, undercut pricing, really send, you know, a signal of trying to put the heat on these big carriers, get them to cut their cost, get them on the defensive, and then while at the same time, building out these…you know, the Uber-style delivery, the drone delivery, potentially buy them when they’re in a weakened position, scrap everything except for their core competency in ground, and then go ahead and bolt on the new stuff that they’re developing behind the scene. Bill: I think that suggests that Amazon would want to buy UPS or FedEx ever one day, and I don’t think they do, because, I mean, even right now, they’re only 5% of UPS’s revenue. UPS can survive without Amazon still even though it seems like they can’t. UPS can survive a 5% revenue hit. I don’t think Amazon ever wants to own UPS. What they want to do is increase service levels to the customer. And in order to do that, they’re gonna end up competing with UPS and FedEx. But I don’t think…they wanted to own Zappos. They wanted to own Quidsi and Diapers.com. And so they went head-to-head in a price war with them and eventually won by buying them. Or you could argue that eventually they lost, because they had to buy them, and couldn’t drive them out of business. But either way, they tried to go head-to-head. I don’t think they’re trying to go head-to-head with UPS and FedEx because they want to win the shipping business. 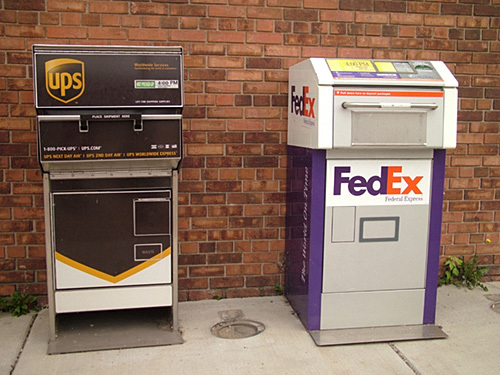 I think they are going to head-to-head with UPS and FedEx because they want the customer experience to be better than what UPS and FedEx are offering, and also they’re spending a ton of money with UPS and FedEx, and they like to save some money. It’s different. It’s not that they’re competing for the same customers. It’s a question of vertical integration like Zack was saying. Zack: Yeah. I mean, for me, the question is not whether UPS or FedEx can withstand a 5% hit to revenue, it’s a 5% hit today if they were to cut them off completely. But as Amazon gets to be a more and more important e-commerce player, at some point, it could represent 30% of UPS’s revenue, because Amazon is stealing market share from everybody else. So, you know, how much can UPS withstand, and, I mean, to your point, Andrew, what you’re talking about, I just don’t…there are so many paradigm shifts happening in logistics right now. You’ve got self-driving cars. You’ve got delivery robots that are being…you know, starting to be deployed on the sidewalks. You’ve got self-driving semis. You’ve got the Uberfication of everything, where you’re getting…Amazon can have their own fleet. There are so many changes being made that I think it’s unlikely that UPS or FedEx, what they have today, that they’ve built an infrastructure, is gonna be valuable 10 years from now. Bill: Which is why I agree with you that Amazon does not want to own UPS and FedEx, and their legacy carrier network. They’re trying to build something totally new. That is, might put UPS or FedEx out of business by outcompeting them. But that’ll probably be…it might not put them out of business, but it’ll certainly mean that Amazon no longer is a customer of UPS and FedEx. Zack: Right. And so I think we agree that within the next few years, five years, we’ve seen peak UPS or FedEx. Bill: Probably so. Yes. At least as far as Amazon’s usage is concerned. I mean, other growth and other things might…people might still use UPS and FedEx. I think what this debate was supposed to be is, as Amazon builds this alternative carrier, will Amazon open that alternative carrier to non-Amazon.com packages? And you think the answer is yes, because why? Zack: I think yes, because it represents a huge revenue opportunity especially as UPS and FedEx are on the decline. I think it represents a huge revenue opportunity. I mean, Amazon is doing a hundred billion in revenue now. I mean, how much is UPS or UPS and FedEx doing? And the second part is, I think that they…you know, I was just reading Bezos in 2002, wrote a letter, a memo, saying every time you develop a new service, it must be designed from ground up to be accessible to external developers. Whether or not we eventually open that to external developers or not is a different story. And so, we can pretty much agree that the shipping program from the ground up, Amazon’s freight program, is gonna be designed to be used by external people. And so, they’re designing it, you know, with that in mind up front. And I think it would be very ill-advised to not open it up to other people due to the problem of vertical integration where you lose service levels from having a captive internal customer. Bill: I think, and see, the reason I think they do not think…I think they will not make it available to other companies, because…I think the game that Amazon is trying to win is to control all e-commerce flows through Amazon. And their single biggest competitive advantage to make sure they win the e-commerce game is two-day shipping, one-day shipping, 30-minute shipping via Prime Drone Air. And that is why consumers will come by to them, and that will ensure that they get a slice of every single piece of e-commerce. I think it is too core. I think it is too big of a competitive advantage to let someone like Walmart have access to. Zack: Right. And I think they could offer other service levels and keep the golden goose to themselves. Bill: See, I think what’s core to their business about payments is…what’s core to their business, the two things. I mean, you ask almost anybody in e-commerce, we all sat here together, it was pretty cool, yesterday, we used Touch ID Apple Pay on the web on my phone to buy something from my Shopify store with no further integration with Shopify. I just flipped it on with Apple Pay and it was phenomenal. And the cool thing about that was one of Amazon’s traditional advantages has been that they have everybody’s credit card number and shipping address on file already. So, it’s easy to buy something from Amazon. And so, people buy things from Amazon because they trust Amazon. Amazon has payment on file, and you just go to Amazon and you say, “One-click checkout”. It’ll be at your house in two days. So, one of Amazon’s core advantages is that they have everybody’s info on file, which is being a little bit eroded by Apple Pay. The other core advantage Amazon has is two-day delivery, and soon to be one-day delivery and same-day delivery. I think Amazon knows that. And the reason they were doing Amazon Payments is because that is their core, which is we can process payments. We have everybody’s credit card on file, and we want a bite of all these transactions. Bill: See, that’s what makes sense to me. Like you can use Amazon Drone Carrier to pick up from your warehouse and do an essentially seller-fulfilled order, but only if that order came from Amazon.com. Just like they’ll probably eventually to go, “We won’t fulfill any non-Amazon.com orders out of our FBA Fulfillment Network,” which is incredibly powerful. And that means they get lock in on the customer side and on the seller side. And that’s where, I think, they’ll go with the carrier. You can use our drone carrier to send packages from your warehouse, but only if those orders came through Amazon.com. Will The Government Ever Step In? Zack: So, here’s where it gets interesting. Because, you see…let’s say Amazon puts 10 to15 years ahead. Amazon is doing drone deliveries and, you know, same-day delivery, and two-hour delivery, and all sorts of amazing service levels. UPS and FedEx are out of business, or they’re a ghost of their former selves. Now, at what point, and Amazon, all of a sudden says, “You know what? We’re not going to maintain the service that UPS used to do for non-Amazon transactions.” At what point does the government step in and say, “Well, you’re a common carrier, and you have to take everybody’s packages and give them the same priority as Amazon.” Because if Amazon comes in and puts everybody else out of business and they’re the only way to ship, at what point does the government come in and say and start regulating it? Bill: See, I don’t think they’ll put everybody else out of business, because what you’re assuming is that every package in the world is going through Amazon’s carrier. But if Amazon is not willing to take every package in the world, because they consider it’s a competitive advantage, the other 95% of people in the world, as they are today, are shipping their things with UPS and FedEx. Zack: Right. But if Amazon is responsible for 50% of e-commerce volume, in a few years, 5, 10 years, UPS and FedEx can’t sustain on half of the business. Bill: But they might…I’m saying there’re so many packages that are shipped from company to company that are not e-commerce, that are not B to C e-commerce packages. There’s so much freight. There’s so much B to B packages, parts from the supplier, that supplier, things that are not Amazon, that are not B to C e-commerce packages. And that’s the other 95% that is FedEx and UPS. And Amazon is not gonna take that. As Amazon increases share of e-commerce and e-commerce grows, UPS’s absolute revenue is gonna grow with that. So, they might be…even if Amazon becomes 10% or 15% of their revenue, it’s hard to say…and then they lose, UPS loses Amazon. It’s hard to say that UPS is a shell of its former self at 85% of their future revenue, aka twice their current revenue. Zack: I think we gotta have Bezos some day next week, figure out what’s going on. Bill: I think we do. Andrew: He’s three or four weeks out unfortunately. So, we may miss him. Bill: Well, we should bring him to the workcation for up next year. Andrew: Hey, Mr. Bezos, if you’re listening, get a hold of Mr. Zack Kanter @ZackKanter. That’s Zack with a Z-A-C-K. Myself, or Bill, @BillDA. Gentlemen, it’s been a good debate on the Amazon front. And it’s been a great three or four days here. Bill: It has been. Yes, I’m very glad to have all you guys. Andrew: Yeah, it’s been wonderful. Zack: Gotta do it again next year. Andrew: Looking forward to it. Hopefully, I don’t know if we mentioned this at the top, but we are in the middle of a tropical storm. Andrew: Like literally. What’s the name of the storm we’re in? Bill: I don’t know what it is. But it’s definitely raining. So, we’ll have to do this again. We’ll do this again next year. This is the third annual Fripp Island Workcation, and next year will be the fourth annual. So, stay tuned for next year. Zack: I think you guys totally spoiled it, because usually, you know, you say, “Beach vacation.” Everyone’s assuming we’re sipping Mai Tais, sitting out on the beach, and we’re actually sitting in Bill’s living room right now, and the house is about to blow away. Andrew: But we did wear the speedos for the effect, right? Bill: Speedos and Bud Light Lime. Andrew: Bill, thanks for hosting us. Zack, thanks for coming on. And thank you everyone for listening to the last three episodes. I hope you do it again next year. Thanks so much to our podcast producer, Laura Serino, for all of her hard work in making this show possible and to you for tuning in. Thank you for listening. That’ll do it for this week, but looking forward to seeing you again next Friday.